Burning wood burns a million different colors, long after the flames go out. I said that, probably not the first, but I said that. I just read a poem that started off about a man’s eyes being dark, like burning wood. Maybe burnt wood, but burning wood is not dark at all, it’s brilliant. Who ses Betta Fish don’t need heaters? I found Banana’s filter unplugged one morning recently, and his tank was about 67 degrees. When I fed him, he seemed uninterested, and later when I let him see the female that I hope will get along with him for youngin’s, he wasn’t even interested in looking at her. I touched his 1 1/2 gallon tank to pull it out where i could reach better and found how cold it was! Look where he spent the rest of the morning after I plugged it in! He’s like a lizard soaking up the sun off a rock. Banana would like to argue with anyone who says that Bettas only need tiny bowls with no heat. For one thing the smaller it is, the more you have to change the water. Even if you do it right, [like being sure the water is warm, and doing it slow enough to not shock the fish] 100% water changes are rough on the fish. Lets face it, most fish owners don’t change the water often enough to keep the quality where it should be. 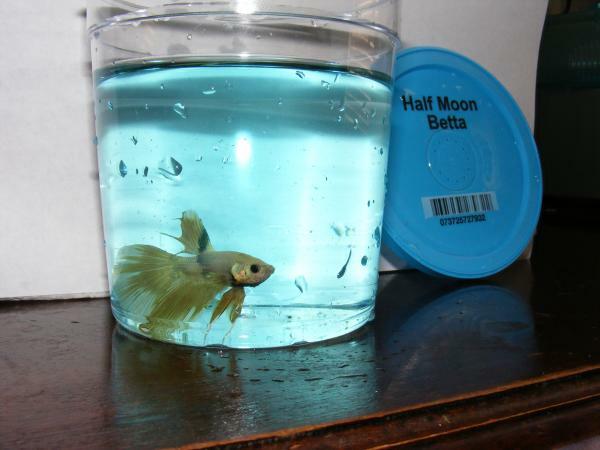 Just because a Betta is tough enough to live through it longer than other fish, doesn’t mean he should have to. 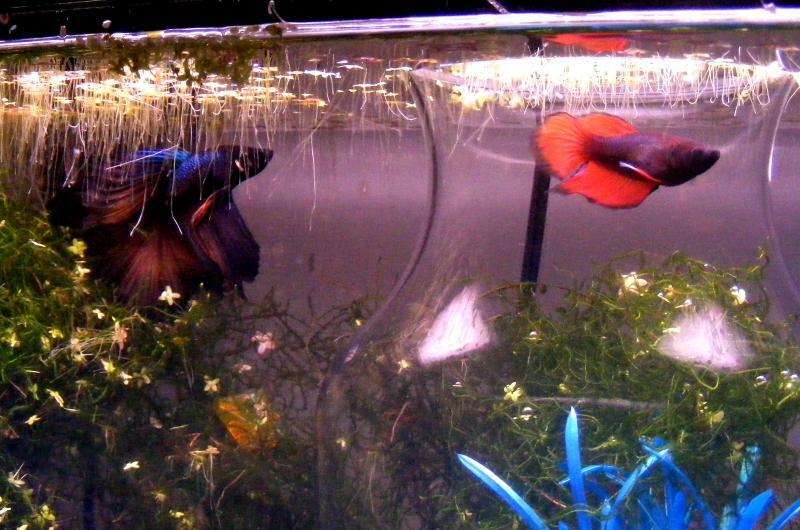 The bettas in the cold little cups look pale and uninterested, and you never see them flare. They are just not at there best. I found several of my Betta’s tanks at goodwill and the salvation army for $2 or @3 dollars. The heaters i use are all under $15 and most under $10. Some i found online and others at the local pet shops. The heaters were all purchased new. The one & two gallon tanks with small lights and heaters cost 83 cents to $1.10 to heat and light for a month, and that estimate is if they are on 24/7. That is not a lot to spend to have a healthy, happy pet of any kind. 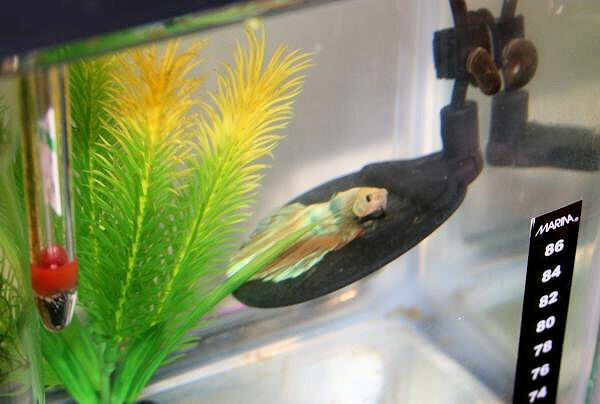 And for everyone who was concerned about him when I posted these photos on Bettafish.com, he is fine today and showing off for his girl, or maybe for the camera. Do you think he could know I’m taking his photo to make him famous online? The water temps would have changed slowly, probably similar to night time in the wild places these boy’s relatives live. Banana doesn’t want to be a wild fish. You can see it in his eyes. close, but i wouldn’t call him a Half moon. I think he’d be called a Super Delta or maybe just a Delta tail. It’s fine, Deltas are my favorites. I got a Plakat Male once labeled “Female” His fins were clamped and he was very pale. I didn’t look close enough to even suspect. If you complain to the LPS, they will just say that their staff sometimes mixes them up when they’re cleaning the cups. We know from the look of most cups, that cleaning doesn’t happen very often, so I can see how the pimply faced kids might get confused. NOT! Pepper looks better. The damaged part of his fins are gone. 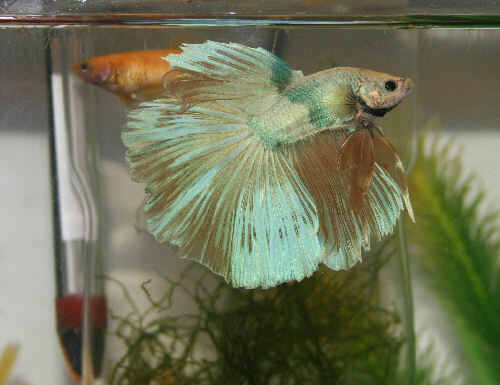 He is left with ragged, shorter fins, but looks and acts healthier. He is more active too. I don’t know if he had fin rot or what, but a dose of medicine and a warmer tank seems to have fixed him. I hope he’s okay now. Pepper and Lemon are in the same tank now, and she swims through his fins, he doesn’t care about chasing her, biting her, bubble nests or courting, but he also hasn’t hurt her or made even one aggressive move that I’ve seen. I work on the computer right next to the tanks where boys and girls are together. He came out of the pet store cup with ragged fins. I’m keeping his tank warmer and after i took the photos, I took Lemon out of his tank. 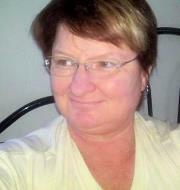 She is the most beautiful girl I’ve seen locally. 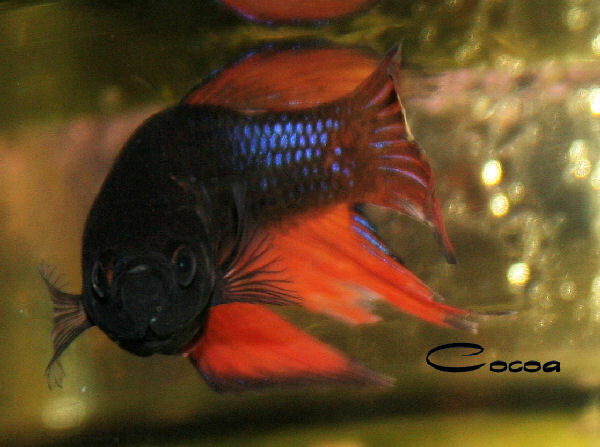 There are gorgeous females online too, but her fins are as close to orange as I’ve seen. More research is needed on my part to see what color and fin categories she falls into. If nature takes its course she will be Mocha’s girl. Mocha is what I finally named the chocolate boy i found a couple of months ago. I found Cocoa at Crazy Critters in Rapid City SD. 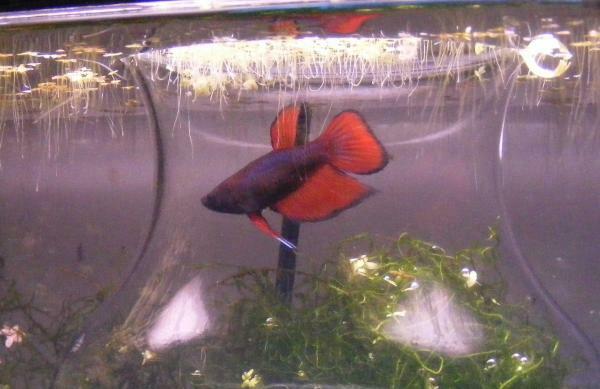 Actually they were kind enough to call me when they got a fish, male or female that had any orange coloring. They only keep about 10 bettas at a time and they have always been clean and healthy. Last time i was in they had mostly double tail bettas with a lot of blue color. I picked up a sweet little blue crowntail while i was there last. Cocoa is living where Mocha can see her. Its been weeks, but the first time i put them together, Mocha bit a chunk out of her beautiful tail. I hope he gets his act together.